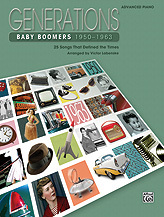 The Generations series chronicles the music that defined 20th-century America. Each book contains 25 of the most-loved songs from iconic performers and songwriters, providing a soundtrack to the life and times of a generation. Titles: All I Have to Do Is Dream * Blowin' in the Wind * Blue Moon * Blue Velvet * Bye Bye Love * Do You Want to Know a Secret? * Earth Angel * I'm Walkin' * It Was a Very Good Year * It's My Party * James Bond Theme * The Lion Sleeps Tonight * Mack the Knife * Misty * Mr. Lee * Only You (And You Alone) * Puff (The Magic Dragon) * (We're Gonna) Rock Around the Clock * Runaway * Save the Last Dance for Me * Shake, Rattle and Roll * Sixteen Candles * A Teenager In Love * Turn! Turn! Turn! * Wipe Out.